Irean Zhang has joined Klinedinst San Diego office as an associate. Ms. Zhang focuses her practice on professional liability defense, particularly in the area of legal malpractice. 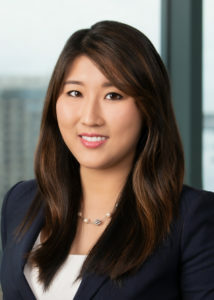 SAN DIEGO, CALIFORNIA – Klinedinst PC is pleased to announce the addition of Irean Zhang to the firm’s Professional Liability team, where she will work in defending clients in malpractice claims brought against attorneys, accountants, and other professionals. Prior to joining Klinedinst, Ms. Zhang worked at a national AmLaw 100 firm in business litigation, with an emphasis in real estate litigation. Ms. Zhang is a first generation Chinese-American, and is fluent in Mandarin Chinese. She is a member of the State Bar of California, San Diego County Bar Association, the Federal Bar Association – San Diego Chapter, the Lawyers Club of San Diego, and the American Inns of Court, Louis M. Welsh Chapter.